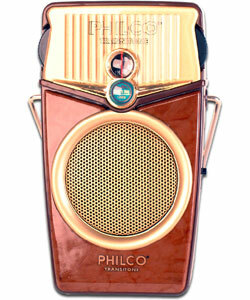 The Transistor Radio Is Back! The transistor radio is back. At least for me. At least for now. OK – it isn’t really a radio. It’s a phone. That I don’t use very much for calls. And it costs $599 dollars (less, really, because I signed up for yet another 2 year agreement) instead of the $12.99 my first radio cost way back when. And it doesn’t run on 9 Volt batteries. It uses rechargeables. And I can get stuff other than Cousin Brucie or the WMCA Good Guys. Hell I can even get radio live from all over the world. Granted its speaker is the size of a dime, instead of a small pancake like this beauty. But today, when my car radio died, and I needed some tunes and information, I decided to grab radio off the air through my phone and stream it on my drive into work. No Bluetooth. No external car speakers. No headphones. Not even a single earpiece directly into my ear. Just an old fashioned transistor radio style station receiver – playing tunes I could hold in my hand. A pocket timepiece instead of a wristwatch? Previous post: Is He Hurt?